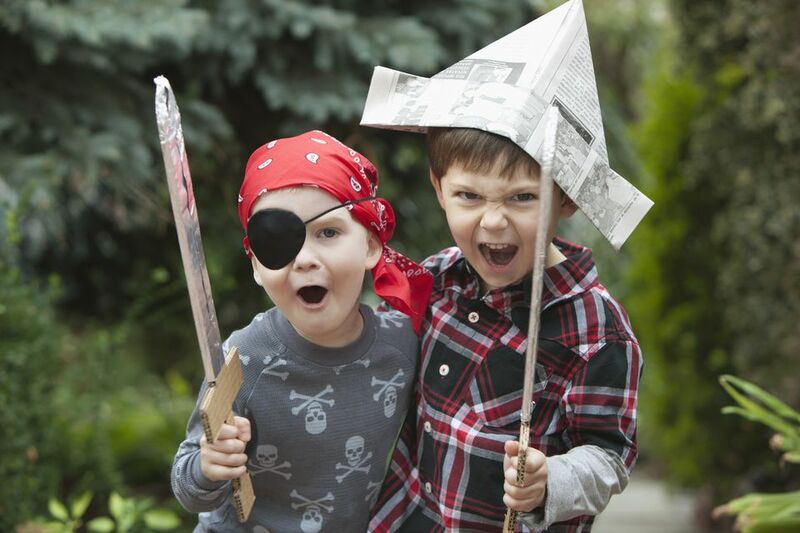 Anyone can be transformed into a pirate with this simple eye patch craft and a bandanna tied around their head. The above age and time guidelines are estimates. This project can be modified to suit other ages and may take more or less time depending on your circumstances. ﻿Print out the eye patch pattern I provide (below). Trace it onto craft foam or felt and cut it out. Take note of where the two black lines are on the eye patch pattern. On your craft foam or felt eye patch, cut four small slits where those black lines are. Cut a piece of yarn or elastic long enough to fit around the head of the person who will be wearing the patch. Push one end of the yarn or elastic up through one slit and then push it back down through the slit right next to the first. Tie the end to the yarn or elastic to secure it in place. Repeat this step for the other side. Before you tie the second side, make sure it fits. If you like, you can personalize it with dimensional paint or markers. That's all! Your pirate eye patch is now ready to wear. Find a stuffed parrot to perch on your shoulder, wrap a bandana around your head, and you can even draw on a fake mustache using some black make-up! Have fun being a pirate.